“The Children From Tehar” cements the idea that this series knows what it is doing, masterfully expanding the world and cast at a gradual pace. In this episode we see Phasma again, introduce the maintenance level, the Chelidae who run the maintenance, and a new villain. The episode is centered around two children on the run who are hiding on the station. Kaz screws up Tam’s compensator so, needing the money to replace it, he decides to find the kids and get them home while receiving the bounty on them. As it turns out. the First Order are the ones after the children, with Phasma telling Doza that they are the children of a powerful non-military family in the First Order. In actuality the children are the only survivors of their planet Tehar, Kylo Ren having butchered everyone else. The season’s secondary First Order antagonist, Commander Pyre, is finally introduced as he attempts to kill the children. Once Kaz, Neeku, and the Chelidae find and convince the children they mean them no harm - they hatch a plan and make the First Order think the children are dead, when would really be living with the Chelidae. 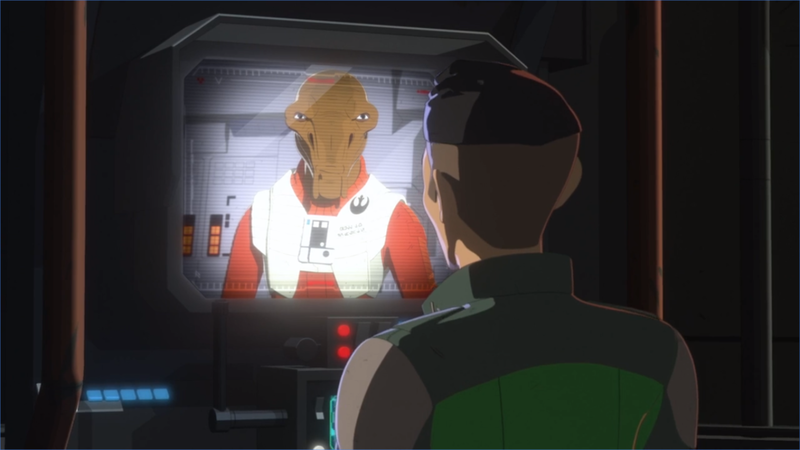 Kaz relays the info on Tehar to Ello Asty who informs him that Leia will want to speak to him about Kylo Ren being mentioned. I did not at all expect we would hear Kylo Ren get name dropped this early, which shows just how willing this series is to reflect upon the larger implications of the galaxy at this time. Overall, the story does not have a very strong theme or moral, per se, aside from showcasing friendship and people having each other’s backs. Neeku repeatedly paying for everyone else is fantastic and, his response that money is to be used to help anyone in need, supports my theory of a proletariat revolt on the Colossus by the end of the season. In all honesty, Neeku gets to do more of substance here than ever before, he certainly has the largest role of the characters—aside from Kaz and BB8—and yet, he had not gotten as much one-on-one time with Kaz. It is wonderful to see their bond strengthen. The titular children: Kel and Eila are serviceable: likable enough and I bet they will be given more personality in future episodes. Commander Pyre has not done anything to particularly impress me like Vonreg has, but he is shown to be quick on his feet and I genuinely find Kaz’s plan that outsmarts him to be clever, so it does not diminish him as a threat for me. Also I like that the Upsilon shuttle seems to be used by Kylo, and people carrying out missions important to Kylo’s orders thus far. The implication I got from the namedrop was that the events on Tehar have to do with Kylo’s search for Lor San Tekka as this takes place after he went off to find the map to Ach-To and meet up with Poe again. We know that Kylo took direct control over that mission to stop him from meeting with the Resistance again, so it is understandable that they want no one to know what worlds Kylo is going to. Speaking of the Resistance, Ello Asty being the middleman for Poe and Kaz here was great, if not a tin bit sad given his fate. His response to Kaz asking if he knows who Kylo Ren is is fantastic and telling given that he was implied to be one of the absolute first members of the Resistance in Bloodline. He would have been in the very small Resistance when Ben turned to the dark side, and no doubt understands who Kylo Ren is. On the whole, there is not much to say about this episode critically, not that that’s a bad thing. Saul Ruiz and Paul Giacoppo do a fantastic job of conveying the larger world of the galaxy and the Colossus, while fixating on a smaller plot with less in the way of furthering character exploration. Instead this episode seeks to drive home to Kaz that the First Order is getting bolder and that The Colossus will soon be more involved in this conflict inevitably.